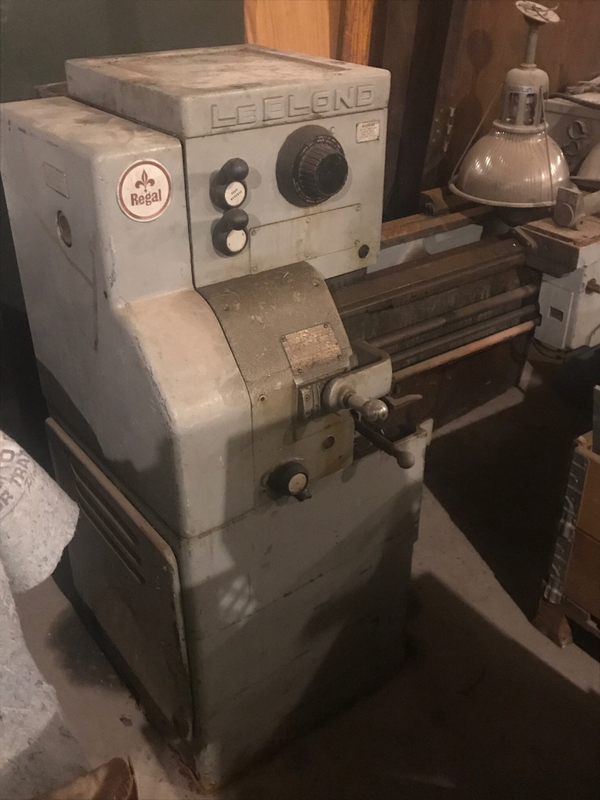 LeBlond Royal 15" x 54" Lathe Restoration or Part Out? 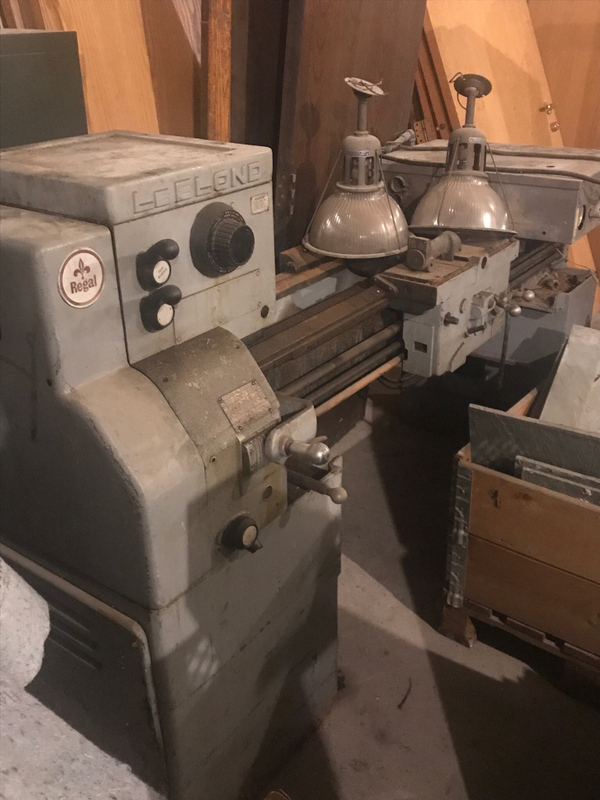 Thread: LeBlond Royal 15" x 54" Lathe Restoration or Part Out? My uncle gave me an old LeBlond Royal 15" x 54" lathe. It was once used by a school system. It has only a few tools and no manuals. There are also broken parts, the biggest breakage being the tail stock. It is beyond repair apparently from a fall. It has been sitting outside for a "couple of months'. So, I want to decide if it is worth restoring, or should I just part it out. I am not familiar with these lathes so, I have been reading a lot of the threads to learn more. I really do not need the lathe since I just finished restoring a Clausing that my uncle gave me a long time ago. So, right now I am leaning toward parting it out. I just got it home yesterday. I took some pictures to document the process of either restoring it or, parting it. A lathe without a tailstock is pretty limited. Show pictures of the tailstock and see if someone here has a brilliant repair idea for you. Otherwise I vote top part it out. The tailstock base is in the chip pan per pic 4 of 5 in the 2nd batch of photos. Yes, the tailstock base, the way clamp and the broken out pieces were all in the chip tray. Here are pictures of what is there. Also, I have opened the top of the gearbox and the gears are not broken. There is some surface rust, but it seems to wipe away fairly well. One of the servo pistons looks pretty rusty. I did not get any pictures, but I do believe the gearbox is good. The wiring and electrical look suspect. Power it up,confirm everything head stock wise works . Then get out the torch !! The bad news is there isn't much to part out there. Your best bet is to sell it to someone else as a project or spare parts. As far as the tailstock, it is repairable. I think there were probably two separate injuries. Someone overtightened to alignment bolt on the back side and broke the casting. Then the handwheel was a separate injury. Its a Regal, not a Royal. I see two complete 15 inch Regal tailstocks on ebay. Since the lathe was free (was it not?) a $400-$500 expenditure is not unreasonable. Under that mess is a very nice lathe, TS is repairable. I'd clean it up and send the clausing down the road. That LeBlond is 10x the lathe any Clausing ever was. Sorry, I just realized I typed Royal instead of Regal. OOPS. I am not a machinist and only use the Clausing lathe I have to make odd parts and pieces for my use around the farm. If I do decide to restore the lathe, spending the money for the tailstock makes the most sense. But I like to tinker, so I may try to repair the tailstock. As suggested, I will first see if I can find a way to get the lathe powered up to see what issues have to be dealt with on the electrical controls and gearing. I do not have a three phase service and to find a fix for that before proceeding. All the suggestions are appreciated. I really do not want to part the lathe out. I too believe it could be a fine machine if restored. Based on small things like the lack of wear I see on the lead screw and the past ownership being the board of education, I think the lathe is probably in good mechanical shape. This lathe may end up sold as a project to someone who can restore it. Be mindful that "school machines" typically see very little use and very little care. I am going to give you some heartfelt advice. CHECK THE GODDAMN WAYS. If the ways are crap, the machine is crap. Don't look at the "mechanicals", look at the heart of the machine......the ways. I learned the hard way, but grateful for the experience. You can fix everything that rides on those ways, and make it like new. But it all rides on those ways. Don't kneel at the alter of classic iron. Don't go down that rabbit hole unless you want to spend huge amounts of money and time. Don't be seduced by the morons that are more than willing to spend your coin. Ain't their project, it's yours! For them, it's a leisurely afternoon plunking on the keyboard. And if the ways are good, then you can contend with the prissy folks that think anything but a new part is unholy. If you find it doable, you're crossing the boundary between operator, and craftsman. Easy to use stuff, hard to take drek, and make it right. If the repairs are good, stand proud, and let the naysayers naybob And, again, this just the "mechanicals". Put a 70's Hesston Hydro Swing swather in front of me, and I can mostly build it back to original from scratch...…..IF I HAVE RELIABLE STUFF TO WORK WITH. Machining is about the machine, nothing else. Please make sure you have a rebuildable machine. If you decide to rebuild I have a parts machine available. I thought I would update where I am with this lathe. It still remains on the trailer under a tarp. I am not going to put any money into it until I feel it is a project I can finish. I am building a 7.5 hp phase converter out of parts I have scavenged to see if I can get the 5 hp lathe motor running. If the motor is good and the rest of electrical seems to be repairable, I plan to move it into my shop. I have already made room for it in the shop, but moving it will be a really big challenge. I have an I-beam arbor to lift things, but will need to strengthen it with bracing before lifting the lathe. It lifted a Van Norman #12 mill twice without issue. Farmersamm I do understand that the ways need to be checked, and will attempt to do that if I bring it inside the shop. Maybe you can suggest some checks to perform on the ways while it is still on the trailer? I do not plan to spend very much money on it until I am convinced I can restore it. From what I know now about this project, I believe it is something I can do. That optimism could change quickly depending on what else I discover. The ways on that lathe are hardened steel inserts.Takes a lot of abuse to wear them out.After you clean them up you may be surprised at how little wear they have. I'd build a fire, preferably coal, to do the preheat/post heat, hard to do it all with one torch. That way it is easier to avoid overheating an area and having to regrind. Nothing quite so satisfying as when the bronze "wets" the surface and starts flowing out like it should. It must be nice to be able to scrap such a good machine, I don't see them around here. Start heating with a rosebud tip. Get it dull red. You will know it's hot enough when it flows out on contact with the rod. You want it to (tin) like when you solder copper. A good cast iron brazed repair is as strong as original. Somtimes stronger. Those who call brazing glue aren't getting it hot enough. As said above The charcoal fire may be a good idea to get that part pre heated. That's a lot of iron to get hot. Use a good size torch. An example of heavy cast iron brazing. I repaired this part about ten years ago. It was bumped with a lift truck and knocked over. It broke into three pieces. I did add some 1/8 by 1/2 bar stock to the edges across the fractures. Tom gave it to me. I offered it back to him after I fixed it. He is 75 and said he used the Fanco arbor press when he was 18. He told me you fixed if so it's yours. The paint didn't stick to the brass so it's getting a bead blast and repaint. I know paint is wasted time. I did tack it together with nickle rod with the arc welder to hold it together before brazing. Even if you dont reuse the tailstock if you learn to braze cast it can save you money often working with old machinery. It's not a pretty repair. Smaller parts I can make better looking braze.